This photo static copy of the Shawnee Sun represents the first newspaper printed in Kansas (then known as Indian Territory). The paper was written in the Shawnee alphabet created by Johnston Lykins, a Baptist missionary to the Shawnee Indians. The newspaper lists John Gill Pratt as publisher. 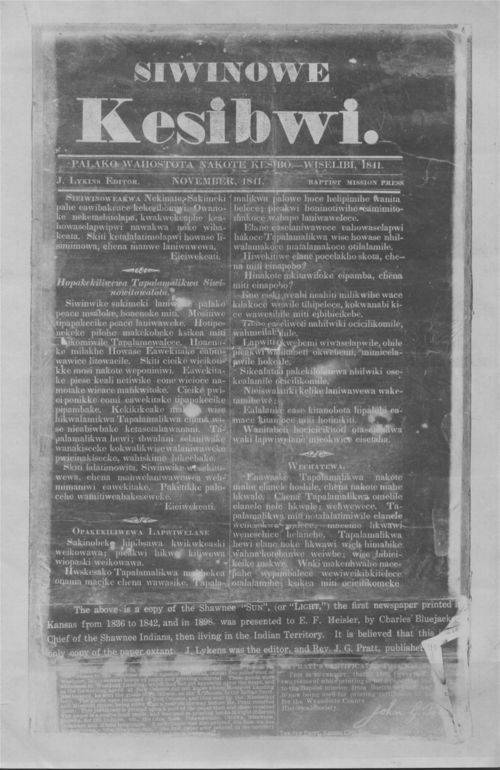 The original paper copy of this issue is held by the LaBudde Special Collections Department, Miller Nichols Library, University of Missouri-Kansas City. This newspaper deals with natives' assimilation into white society and their education at Christian missions. It could be grouped with two other documents (the Shawnee vocabulary and Shawnee verb conjugation) both of which were also chosen for this 7th-grade standard.